A member of the U.S.S. Alabama Battleship Commission has clued us in on the next step in the effort to let Xavier de Richemont employ the landmark vessel as a palette for his next noteworthy light installation. The world-famous French artist has built on the idea since his 2012 visit as part of his first American work, “Hokushima” at the Centre for the Living Arts (CLA). 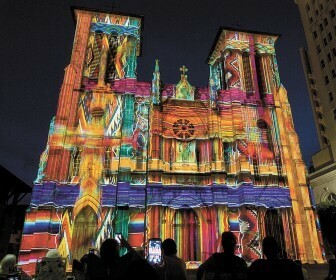 Xavier de Richemont’s “The Saga” lightshow on the San Fernando Cathedral in San Antonio, Texas. A working model of his vision has been in place at the downtown showroom for the last year and a half. There have been sticking points with the commission over its content, which has resulted in some reworkings of the design at their request. Apparently, CLA is the facilitator for negotiations between the artist and battleship stewards. CLA Board Chair Mike Dow confirmed their role and a scheduled Aug. 7 demonstration to the commission of what de Richemont unveiled in San Antonio on June 13. “I don’t know if you saw it but it was awesome,” Dow said with abundant enthusiasm. He felt confident the commission would be impressed. His excitement mirrored comments about not only Richemont’s installation at CLA but worldwide. 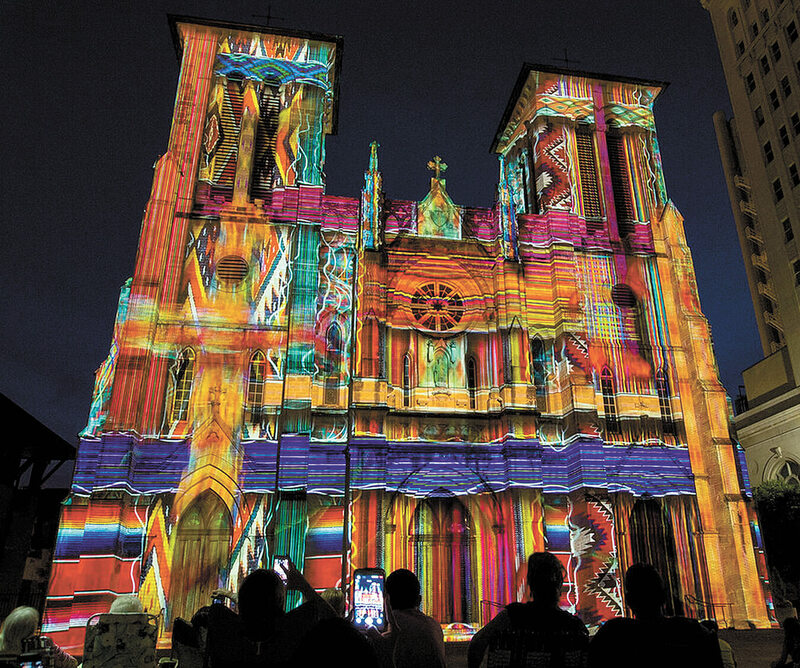 He has built the projections of animation and music on cathedrals and similar landmarks across Europe and North America and his invitation to utilize San Antonio’s treasured San Fernando Cathedral for “The Saga” was highly lauded. Video of its premiere and several other showings can be found on YouTube. The San Antonio work is a panorama of their city’s history. It begins with prehistoric times, ventures through the Native American residents then Spanish rule, the Texas revolution and early statehood, the Civil War, the cattle and oil legacy and into contemporary times. The musical mix incorporates ethnic and period examples along with ragtime, blues, even a touch of Bob Dylan and Allman Brothers. Word reached Lagniappe that one of the big sticking points in the design for the ship was Richemont’s use of azaleas. We asked a commission member if the city’s namesake vibrant blooms were indeed a point of contention. Naturally, questions arise at this news. If the key point here is “a memorial to veterans,” what else is going to be deemed inappropriate? What about our Native American, French, Spanish and British heritage? What about Confederate history, a military force that not only fired upon American veterans but took their lives? What about the use of music? Will that cut the mustard if it’s not been written for patriotic purposes? Should more difficulty arise, perhaps Richemont could be persuaded to look at other structures around Mobile. The Roman Catholic church has shown a willingness to work with the artist in the past so maybe they would do the same with the Cathedral of the Immaculate Conception. If not, maybe we could move to a third choice with the Scottish Rites Temple on Claiborne. 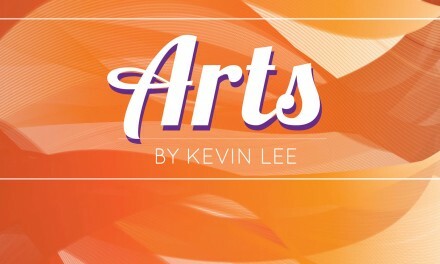 It certainly has the size needed and is even a nice neutral tone, suitable for a canvas.